So, what are we going to eat when all the farms have been “conserved” into Yuppietowns full of McMansions with two SUVs in every driveway? I am pretty cynical, but in my wildest dreams I couldn’t come up with something as cynical as this. This entry was posted in Farming, General Writings, Places to See, Tom, Wausau. Bookmark the permalink. Not to be a contrarian…but who is at fault here? What is wrong with a farmer selling his land? The farmer, most likely, is selling his land because he or she cannot make any money farming. Family farming is getting pushed to the side by corperate farming and when families can make money farming sometimes they have to sell. On a side note. . . .My Dad and step mom recently did a very interesting thing. They were milking goats for a living and ended up getting out as quickly as they jumped in. Why? They decided that they were doing for the wrong reason (for them–in their own words). Money. They could not live on their love of farming. So what did they do? They sold all the goats except enough for their own use, sell the house to my brother, and they have now moved into the back corner of their 40 acer lot. By the way–they are also slowly selling off their beautiful heard of Shetland sheep if anyone is looking! They are CHOOSING to live with out modern electricity, sewer, or heat and are building a cabin and a small barn. In stead of selling the farm to a developer, they sold the farm to my brother and continue to live on the land. Not really related to the topic at hand here. . .but I had to share! Why? Because I am so proud of them. Oh my. . .I should have proof read. Please excuse my spelling errors! Way to go Racheals mom and dad. My comment is this…do we fault the farmer who makes the choice? Do we fault the developer for buying land? Were faulting people for doing what is in there nature to do. Maybe not the farmer, but the act of getting money and security for his family is simply not wrong. Faulting a developer for buying land…thats what they do. I think if the issue is the symptom, which I think it is…then I think it is fair to fault us all. We are in a culture that does not protect farmers. But then again we don’t prtect teachers. Actually, the developer IS at fault here — for their cynical false advertising "marketing strategy". 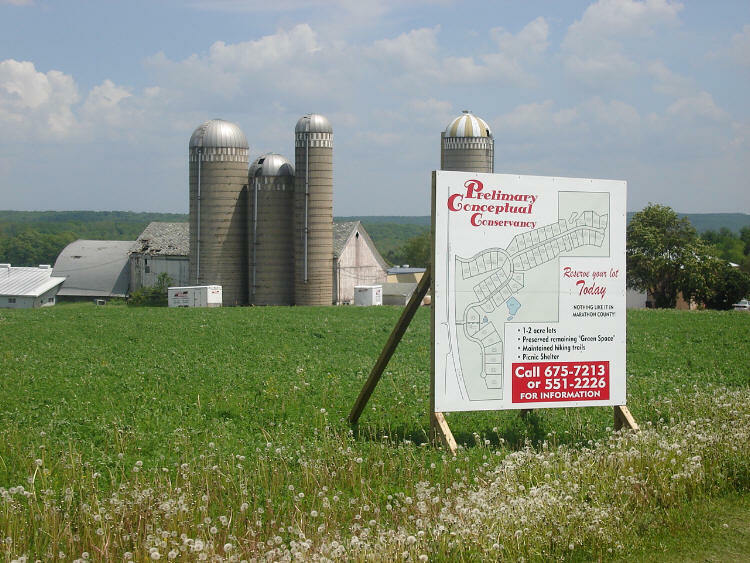 "Conserving" a farm into 1 and 2 acre lots with a smidgen of green space and a hiking trail? It's like saying McFood is healthy. Yes it is sad that famers can make more by selling to a developer, but that was only part of the point here, at least as far as I was concerned. Thats fine. Thanks Crash. I know that the developer is the bad guy, but from the post I was not sure why he was the bad guy. I have my perspective on why he is the bad guy. But I don’t think the post made that anything other than an implication. The pretense that these folks are buying into a conservatory is insanity. The Conservancy of a city lot. Well then I want to declare my home, and the small land it sits on a conservancy. Its horrid marketing. It really really is. Our country has come to this. But I feel we should decry these things specifically. Tell me what you think, let me respond to the thought. I know this is not about the McMansion development, but near highway K. Behind Fleet Farm, what is the new building being erected by Ghidorzi??? Since I live in Cali, I was in Wausau over Memorial Day and saw that and am inquisitive! I have some insight on ‘conservancy’. The general idea of a ‘conservancy subdivision’ is to lay out the development with small lots located closely together. The remaining space is “conserved” in its existing state to be used as common space by the residents, or sometimes dedicated to the public as park space. (I believethat the new Greenwood Hills condos have trails that can be used by the public). The environmental benefit of these layouts is reduced impervious area due to shorter roads. Paving a field increases runoff rates and leads to soil erosion, the primary pollution problem in our streams. Landscaped areas and the chemical applications associated with them are also reduced. Of course we don’t want to see small farms disappearing, but many times the farmers property is his 401K. They don’t want to be told that they can’t sell to the highest bidder when they are ready to retire. Urban sprawl is another issue, but the developer should be most concerned about it. A glance through the latest real estate guide will show over 1,500 lots for either ready for building or currently being developed. From a capitalistic standpoint this sounds like a saturated market to me. The point is that this is an improvement from twenty years ago when we put the stream in a concrete pipe, filled in the wetlands and designed plats without thought to existing site conditions. If you look a little harder, you will find residential developments going up in the area that should disturb you more than this one. The farmer has the right to sell, and the developer has the right to build. Everyone else needs to pay attention to what the local municipalities are up to. Attending planning commision and local board meetings early in the development process lets your elected officials know that ‘tax base’ isn’t the only consideration when planning a development. A small crowd at an early planning commision meeting can often scare a developer enough to abandon a project. Expect more of a fight once the land has been purchased and tens of thousands of dollars have been invested in the project. If I ramble any longer, this will turn into a post of its own. Just a disclaimer: I work in the industry, I’m an environmentalist, I don’t work for the above developer and I don’t know what Ghidorzi is building behind Fleet Farm. Thanks for the well thought out comment CB 🙂 And I will echo Dino by inviting you to join us more often, perhaps even consider being a regular contributor. I agree with your comments on the whole, but have to agree with Tom above that judging from the sign on this development, the “conservancy” aspect is more marketing than reality. You are right that the usual approach is to cluster the houses leaving a common green space to be “conserved.” However, I don’t think 1 to 2 acre lots (which is what this sign states are for sale) is really the kind of density that most people who talk about green belt type housing developments had in mind. To me at least, the proportions of a conservancy development would be something like one quarter of the acreage given to housing and three quarters left in remaining green space. The map on this sign has those proportions reversed, with even maybe 7/8’s of the area being housing lots and 1/8 common green space. Judging from the sign (the only evidence I have) it looks to me like a pretty standard ex-urban development with a little “greenwash” thrown over the top. One or two acre lots definitely do not fit the definition of a ‘conservation subdivision’, I think I missed that part. True conservation subdivisions near large cities often include commercial/office space, limiting the need to drive. Unfortunately, ‘Wauzillans’ whom I’ve talked to seem content to live in endless rows of 1/2-acre lots and $3.00/gal. gas hasn’t been around long enough to affect house buying decisions. Developers aren’t seeing a market except for condo/retirement type arrangements. From county records, this parcel appears to be about 180 acres with 50 or so lots (90 acres?). Maybe about a 50-50 ratio of lots to undisturbed area. Also on further investigation it appears that the reason for most of the undisturbed area is wetlands (preserved by state and federal law) or poor soils (simple economics), not necessarily a desire on the part of the developer to preserve these areas. The developer considers the ‘conservancy’ marketing scheme to be a way of making lemonade from lemons. He may prefer to fill the land with 180 one-acre lots, but just doesn’t have a choice. I hope I don’t sound as if I’m defending the developer, just saying it’s past political activism at all levels of government that are currently preserving wetlands, rivers, or archaeological sites. Once the land has been purchased and the engineering work paid for, preserving farms, forests, or other areas is going to be an uphill battle. Great minds 🙂 I was going to append my comment just after I wrote it to wonder exactly what was wrong with the remaning land that it couldn’t be built on. 🙂 But you have done the homework for all of us. Thanks!